Recommended by Motorola and the network carriers. 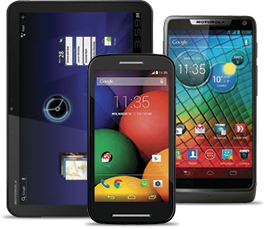 We can unlock all Motorola cell phones and tablets. Permanent and doesn't void the device's warranty. Unlock your cell phone in three simple steps. How to unlock my Motorola phone with doctorSIM? Once you have requested your unlock code through doctorSIM, you will receive an e-mail with simple instructions on how to complete the unlocking process. When you turn on your cell phone, you will be prompted for the network code. Type in the code sent to you by doctorSIM and that's it. Your Motorola is now permanently unlocked! Do I need to know the exact model of my Motorola? You don't need to specify the exact model of your Motorola because the unlocking instructions are the same for all models. All that changes is the unlock code which is dependent upon the IMEI (unique identifier) of each cell phone. However, if you need to know the model of a phone for any other reason you can find out using our identify Motorola model check. I don't know the original operator of my Motorola phone. What do I do? Don't worry, we don't need this information to unlock your Motorola. You can select Network Operator Unknown or Not in List in the carrier provider drop-down. However, our Motorola carrier phone check will provide you with this information if you need to know for any other reason. What do I need to unlock my Motorola? -Your phone at hand, and able to access the keypad and drop-down menus. -The IMEI of the phone. The IMEI is a 15-digit code which you can obtain by dialing *#06# on your Motorola. -A SIM card from a network carrier which is different from the one your phone is locked to. This will make the phone prompt for the unlock code. How do I know if my Motorola has unlocking attempts remaining? A 'contact operator' message will appear on screen if you type in too many incorrect unlock codes and run out of attempts. To solve this issue, insert a SIM card in your Motorola phone from a network carrier which is different from the one your phone is locked to and wait 1-12 hours until the phone prompts for the SIM Network unlock code. Once this happens, follow the instructions we sent you by e-mail to unlock your Motorola. Can I use my Motorola on any network once unlocked? Once unlocked, you can use your cell phone on any compatible carrier located in any country in the world. Does unlocking my Motorola void the phone's warranty or damage it in any way? Unlocking by IMEI does not void the phone's warranty and is the method recommended by Motorola and the network carriers themselves. As the unlocking is processed 100% online, your Motorola never leaves your side. In fact, because you are typing in a simple code, no software downloads or hardware alterations are required to unlock the device. Can I unlock my Motorola if it has been blacklisted? Blacklist reports are additional security measures which prevent the device being used normally and are not removed by unlocking it. If your Motorola has been reported stolen, lost or due to non-payment, you should contact the network carrier to which the phone is locked to remove the block. Once you've done that, you can unlock your Motorola without any problems. The recommended method by all industry players. Your Motorola never has to leave your side. No need to restore or update your software to unlock your cell phone. If an unlock code for your Motorola isn't available we'll issue you a refund immediately. You will be able to use your Motorola with any network carrier in the world. Multiple 100% secure payment methods to choose from. Your Motorola's warranty remains intact. No technical knowledge required to unlock your cell phone.